TRISERT Inserts are internally and externally threaded metal bushings that are installed in plastics, soft metals and wood to provide stronger threads than the base plastic or metal can offer. They tap their own threads as they are driven (turned) into drilled or cored holes. The three, full-length, external flutes provide a balanced, full cutting action. Chips and dust are retained in these flutes and the inside threads stay clean. This is especially important in electronic or electrical work where contamination can cause serious problems. 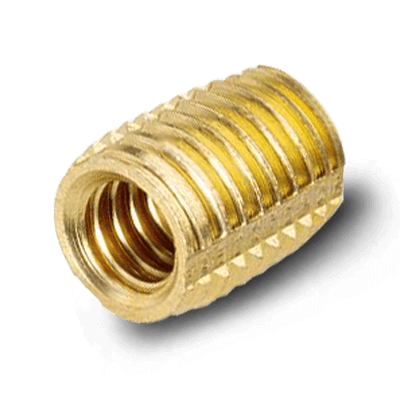 TRISERT Coarse Threaded Inserts are internally and externally threaded metal inserts designed to meet the increased demand for holding power in thermoplastic and thermosetting plastics. The wider spaced external threads reduce installation torque and provide a stronger hold. Installation is simple, as three external flutes provide full cutting action, while retaining chips to keep inside threads clean. TRISERT Slotted Coarse Threaded Inserts are internally and externally threaded metal inserts with a slot on one end. The inserts tap their own threads as they are (turned) into drilled or cored holes. The wider spaced external threads reduce installation torque and provide a stronger hold. Slotted inserts provide an alternative insertion method to the Yardley Trisert Inserts as the slotted inserts can be easily installed with a screw driver or a Yardley inserting tool.